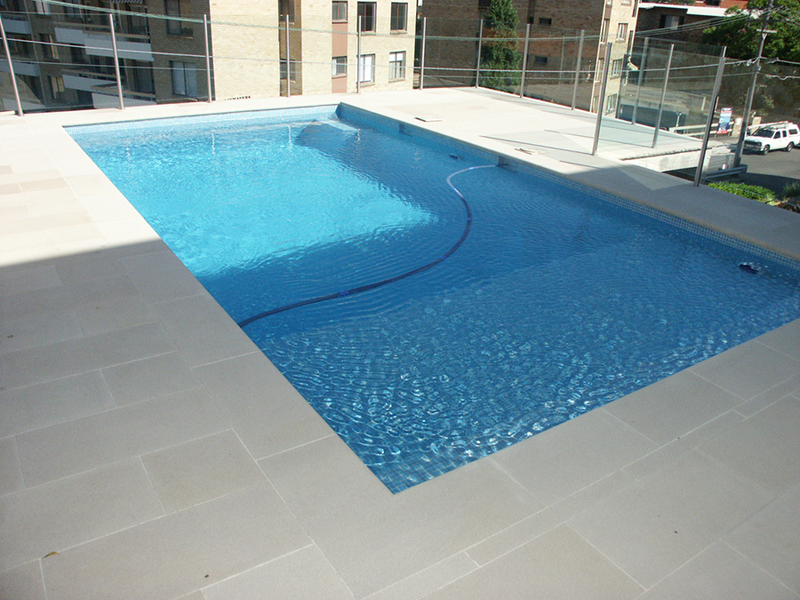 In addition to many traditional in-ground locations, Sunset’s innovative designer pools have been successfully built on cliff edges, raised on pylons and integrated into the structural fabric of new buildings. Sunset’s “can-do” attitude and creative approach is recognised by this Sydney pool owner as among the most important attributes brought to bear on his testing pool brief. 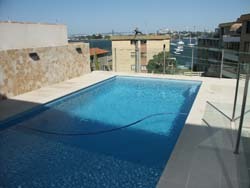 Sunset’s swimming pool designer’s recognised the potential of constructing an elevated pool and deck atop a new garage. Raising the level of the residence’s outdoor space to actually create harbour and City views that had never previously been externally accessible. 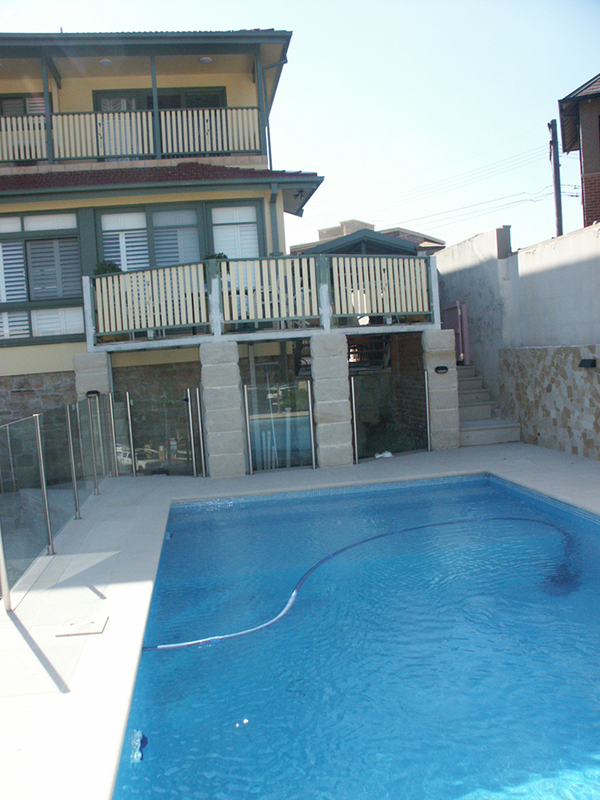 If you would love to enjoy a pool, but have no obvious place to put one call Sunset Pools to discuss your family’s aspirations on 1300 000 412 or complete the enquiry form right now. 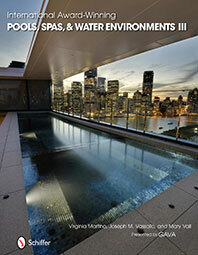 A sparkling new swimming pool is high on almost everybody’s wish list of desirable leisure assets. However, not every property is fortunate enough to have the space for a traditional in-ground concrete pool. Sunset Pools are the difficult access experts having constructed pool in all sorts of unlikely locations, where upon first inspection lesser pool contractors would have claimed that there existed no practical possibility of establishing a new pool. This featured Sunset solution occupies a compact and inaccessible site that had no underutilised space to accommodate a traditional approach. Sunsets’ imaginative garage top solution was considered unachievable by many, but with the aid of some creative engineering, and the will to succeed, the results speak for themselves. Creating an elevated waterproof structure weighing over 200 tons, perched almost five stories above the property’s adjacent access road did demand some uncommon pool building techniques. Precision coordination during the build was also required to minimise inconvenience to neighbourhood residents, although many local residents made up a regular and enthralled audience at key milestones in the structure’s development. Elevating the home’s outdoor area to the coping level of their new Sunset pool acquired outstanding harbour views, creating an expansive new outdoor experience only previously glimpsed from the home’s upper floor windows and balcony. 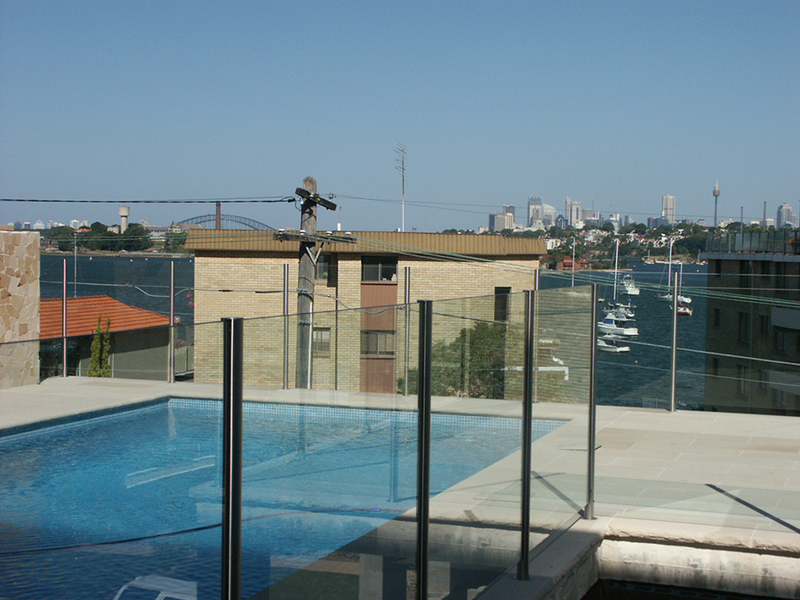 The uninterrupted lines of frameless glass safety fencing, the Sydney sandstone coping and paved entertaining area take full advantage of the new view. 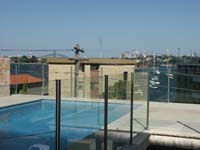 A classic Sydney harbour and City outlook enhanced by and reflected in the pool’s glass mosaic tiled interior. This pools automated water filtration and sanitation systems are discreetly hidden in a control system area below the pool’s surrounds. The high volume hydraulics, a hallmark of every Sunset Pools water management system have been future proofed by integrating ducting for future solar heating into the pool shell and through the house. Through discussions with a Sunset Pools designer, these fortunate individuals were able to merge their imaginative leisure concepts with the difficult access expert’s advanced pool engineering skills and achieve this exceptional solution. An innovative designer pool that actually saved them money during construction as a result of Sunset Pools’ numerous construction variances. The result is a distinguished new attribute to this lucky family’s residence, an enhancement that not only adds significant property value but also establishes a distinctive Sunset dimension to their lifestyle. To discover how a quality Sunset designer pool can enhance your property’s value as well as you lifestyle call Sunset Pools to discuss your family’s aspirations on 1300 000 412 or complete the enquiry form right now.